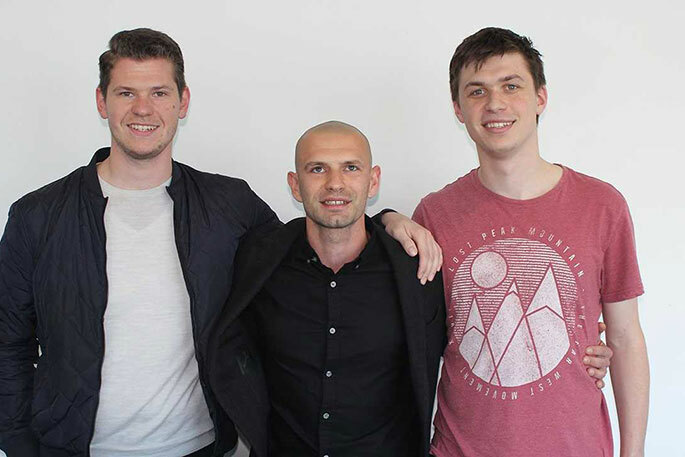 Will Haringa, Max Arshavsky, Sebastian Wieczorek of Zenno Astronautics. A $25,000 boost from a University of Auckland entrepreneurship competition will help a start-up company send more satellites into space. Arts and commerce student Will Haringa and engineering students Max Arshavsky and Sebastian Wieczorek founded spaceflight systems start-up ZENNO Astronautics in 2017. Their aim: to develop a propulsion system for small satellites, and a suite of software for mission planning, development and operation. Will, who also co-founded student space club Impulse, says the new satellite software will simplify the process of sending the satellites into space. The company is currently preparing a space debris mitigation plan for the first satellite to be launched by the University. “We look forward to acquiring flight heritage, strengthening our relationship with the New Zealand Space Agency, and facilitating space exploration nationally,” says Max. Now they have won $25,000 in seed capital in the 2018 Velocity $100k Challenge, the annual University of Auckland competition for emerging entrepreneurs. The prize will help them release their initial software product in 2019. Velocity is the country’s leading student-driven entrepreneurship programme. Since its inception in 2003, alumni have launched more than 120 ventures, attracted over $221 million in investment, created 600-plus jobs, and sold products and services into 37 countries. Examples include Tectonus, whose first-of-a-kind earthquake protection systems were used in the new Nelson airport building; and Greenspot Technologies, which makes nutrient-rich alternative flours from fermented fruit and vegetable pulp that would otherwise go to waste, and this month received $1.2 million seed funding from France. This year a record 95 teams entered the Challenge, which has a total prize pool of $100,000 and is open to University students, staff and graduates. Velocity CEO Matt Canham says the talent and passion seen from this year’s teams is exceptional. Biofouling – the build-up of biological growth on submerged surfaces, such as boat hulls – creates a headache for marinas, boaties, and marine farmers. Current solutions are ineffective, temporary, or toxic to the marine ecosystem. Electroclear is developing a permanent non-toxic solution involving ‘intelligent electronics’ to inhibit fouling organisms. Team members are Dr Christopher Walker and Patrin Illenberger (both PhD candidates at the Auckland Bioengineering Institute) and Associate Professor Iain Anderson (Engineering Science). Together for Good is a personalised relationship skills course that draws on the latest science to help clients de-escalate conflict, overcome biases, and have lasting, healthy relationships. Its tiered design includes online modules, one-on-one and group sessions. Team members are Holly Dixon (PhD student, Psychology) and Bradley Patten (psychometrician at the Faculty of Medical and Health Sciences). Plastic surgeons train over 3,000 hours to develop microsurgical precision. AVASA simplifies microsurgery with a novel surgical device to help surgeons perform microsurgery exponentially faster with laser precision. Team members are Dr Nandoun Abeysekera (Auckland Bioengineering Institute), Dr Hans Kim, Venuri Weber, Jörg Weber and plastic surgeon Jon Mathy. Leaks are the number one cause of death after bowel surgery, and cost hospitals thousands of dollars to treat. The Surgical Canary is a medical device that monitors patients for leaks, and promises to make surgery safer and cheaper for the millions of people who undergo bowel surgery every year. Team members are medical student Nelle-Rose Cameron, Associate Professor Greg O’Grady (School of Medicine), Research Technician Bruce Stokes (School of Medicine), Graduate Teaching Assistant Jialin Sae-Jiw, Associate Professor Anthony Philips (Biological Sciences) and Professor David Williams (Chemical Sciences). All teams have also won entry to VentureLab, an incubator run by the University’s Centre for Innovation and Entrepreneurship, to further develop their ventures.